*Note, if you received multiple emails of the same thing yesterday, sorry about that. I’m still learning how to properly use the email subscription mailing system and seem to have sent out multiples of the same thing yesterday. Exciting news for today is that for the first time all route, we have phone service at camp and I’m able to post today’s entry from my tent! It’s a miracle! We agreed last night that we didn’t want to set an alarm this morning and that the timing really didn’t matter as far as needing to reach a specific destination or be set up for something tomorrow. 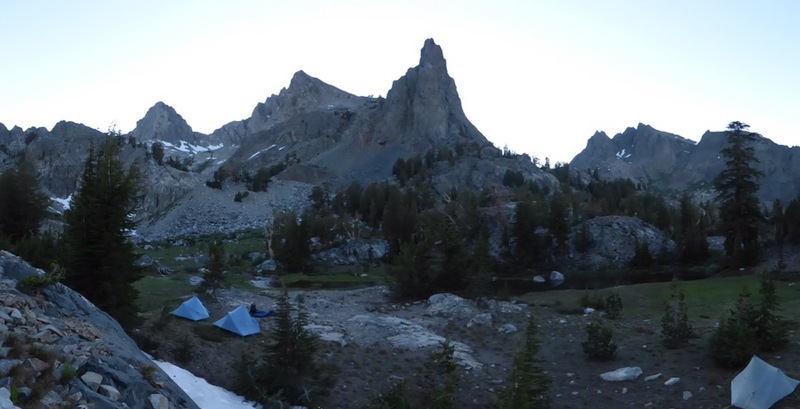 We had originally planned an ideal campsite for Minaret Lake, but decided to just go with the flow. Even though we “slept in”, we still left the condo by 8:45am. 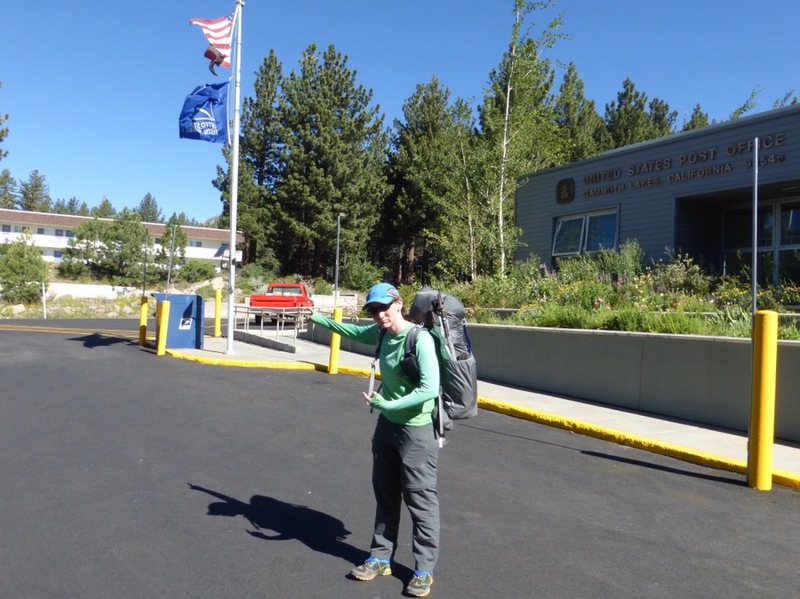 We walked a couple of blocks to catch the free town trolley that runs through Mammoth Lakes. We waited for quite awhile before realizing it hadn’t even started running yet. It came at 9:10am and we took it to the Post Office because we all needed to mail a box of combined stuff we no longer need back to Rockin’s where we will be in a couple of weeks. While there, I just had to point out the ridiculousness (I explained in yesterday’s post) that our resupply boxes that we sent to the Motel 6 (who we called directly for the proper address) were returned to sender for missing the PO Box #, which they didn’t give us when we called Motel 6 and asked about mailing packages. The Motel 6 is literally next to the Post Office! That’s the Motel 6 right next door! We do wonder what the issues must have been in the past between the PO and the Motel 6 for them to not just give the package to them. The packages were clearly labeled as a hiker box with the proper ETA, and it’s very common for Motel 6 to get those packages. Rockin randomly got lucky because hers was delivered by UPS, so the PO wasn’t involved. So frustrating that both our boxes are now still floating in limbo (can’t even talk to someone holding it and I do have the tracking info) and we each had lost about $100 out of the deal after all was said and done. Ok, venting over…but it was right next door! 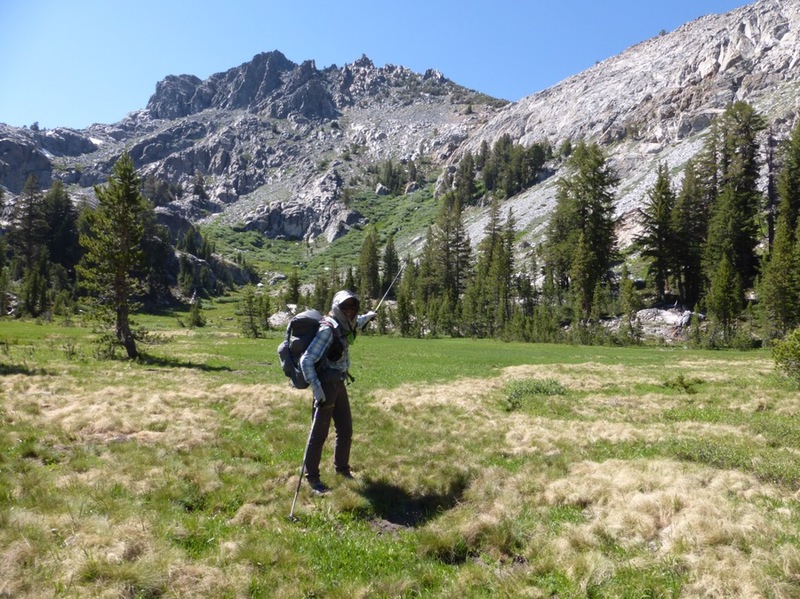 Once we finished at the PO, it took 4 shuttles to get back to Reds Meadow to hike. Normally, it would be 3 shuttles, but we got unlucky with timing it seems. We didn’t get on trail til 11:30am, which really wasn’t the plan, but it was out of our control. 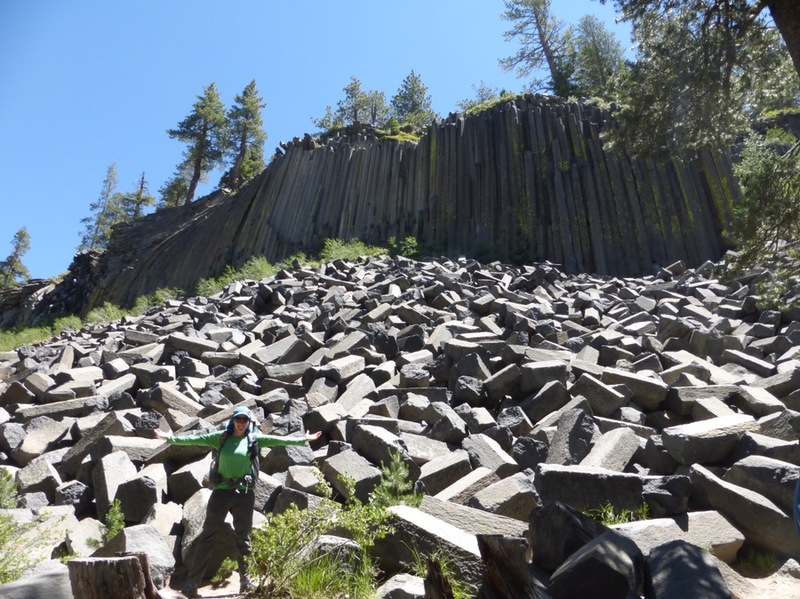 Soon after we started, we passed the Devil’s Postpile, a popular tourist destination that hikers can also see just off the PCT and JMT. We were down at 7,600ft and had about 7mi to hike (mostly on trail) to Nancy Pass at 10,200ft. 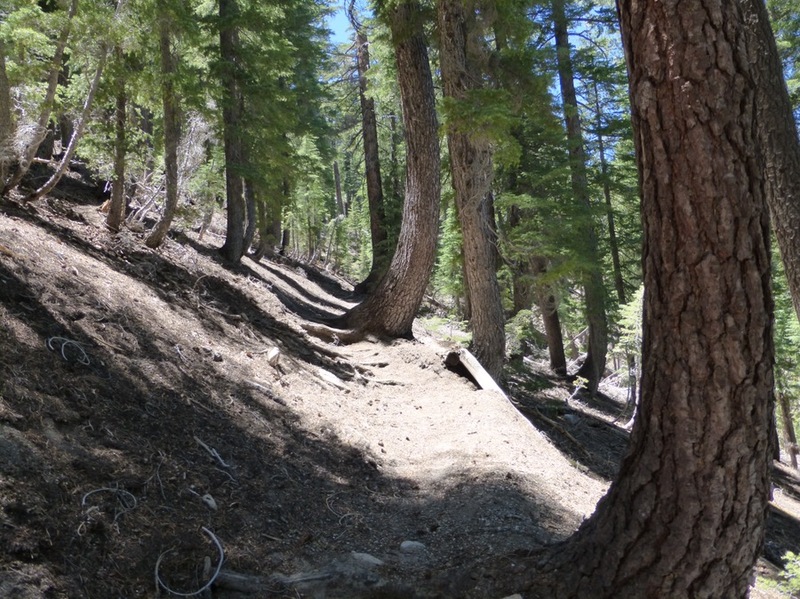 It was pretty hot at first, but then we turned off the JMT to the Becks Lake Trail and it was much more gradual and shaded by trees. I was a fan and was happy once again to cruise while listening to headphones. We soon saw Nancy Pass, and this is an exciting one because Why Not’s name is Nancy. Nancy/Why Not pointing to Nancy Pass. There wasn’t any snow, but we seemed to have made the hike up the pass more taxing than necessary. The guidebook doesn’t give any specific directions because any way should reach the top, we got lured into what looked like a light use trail and it led to a lot of brush for a bit before we got back on track. It was also quite steep and we all felt like molasses today and that the elevation was actually affecting us, which it hasn’t done in awhile. Why Not hiking up Nancy Pass. 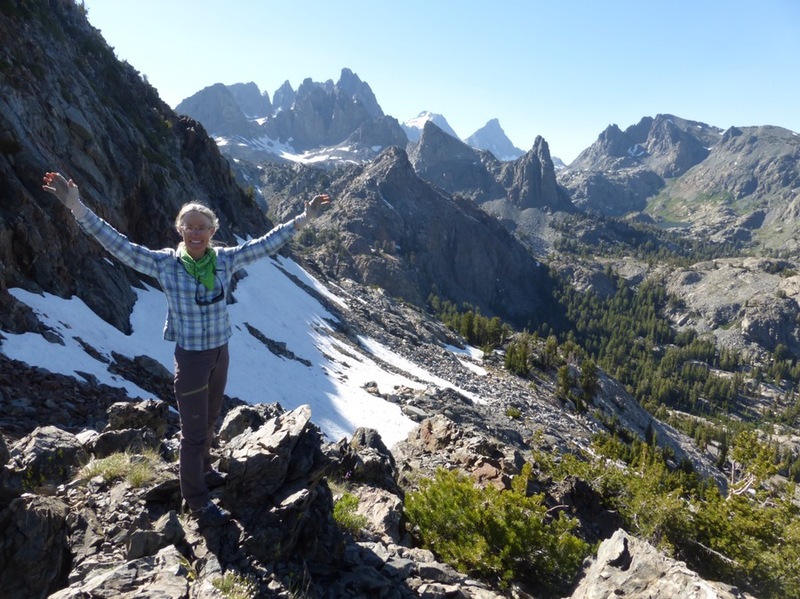 This pass is also significant because about 20yrs ago, Rockin’ went over Nancy Pass as her first off trail pass and when she got to the top and saw the view of the Minarets and Banner and Ritter mountains, she was hooked for life. Pretty cool! Nancy on top of Nancy Pass with the Minarets, Banner, and Ritter in view. We then had the task of finding an “inconspicuous saddle.” It was slow going trying to get to the obscured saddle with loose talus and many obstacles in the form of cliff drop offs and large rock outcroppings…and mosquitoes in droves for the first time really on this hike. When we got to the saddle, it was 7pm and we figured we were probably an hour or so from Lake Minaret. It actually wasn’t a bad spot. It is quite scenic, there is a nice stream, a breeze is coming through to get rid of the mosquitoes, and there was cell service! We happily took it as our camp for the night. Tomorrow we go around that corner to the right of the narrow peak in the center. 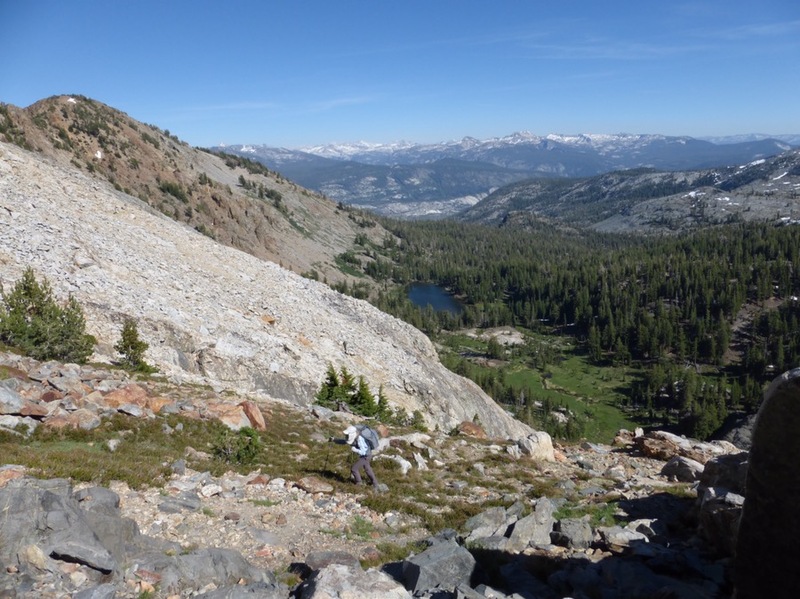 A nice start to what should be a challenging final week on the Sierra High Route. It is also our coldest night yet with more normal Sierra temps today. My keychain thermometer is reading about 45 in the tent, but it’s surely in the 30s outside. Gonna be a brisk morning tomorrow! Cruisin’ right along! Gotta love those “inconspicuous saddles”; thanks Roper! Fancy that, Nancy in a dancy-pantsy stance on Nancy Pass. Why not. “Why Not hiking up Nancy Pass.” That is a beautiful photo.